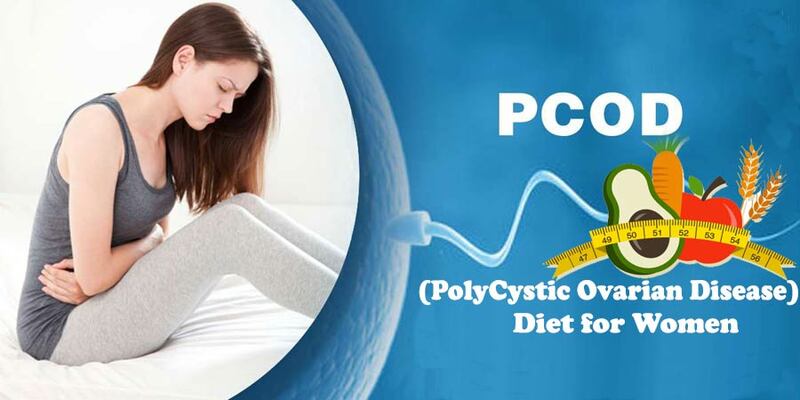 PCOD, which is also popular as polycystic ovarian disease, is one of the most common female disorders observed in the recent times. It is one of the most complex disorders that affects during in the reproductive age of females. Almost, one in ten women is known to suffer from PCOD these days. One female out of every ten females gets worried about her delayed periods every month. She always anticipates and gets nervous about her delayed periods every month. It is a serious disease as it directly affects the chances of fertility among women. Even though is difficult to know the exact cause of PCOD, medical studies and information state that there is a genetic link, possibly abnormal fetal development, insulin resistance, and other factors that leads to PCOD. PCOD is also negatively affected by dietetic errors, lifestyle habits, and certain environmental toxins. Females are noted to have a predisposition to PCOD or it may also run into families. PCOD, if not treated well, not only impacts fertility but has other health implications as well. PCOD is usually treated conventionally with hormonal therapy. But as PCOD is also a red flag for the beginning of type 2 diabetes, Metformin is also prescribed. This disorder being very mysterious in nature one should always try to know hard facts that will actually help treat their health issues, the most common being irregular menses. Here’s where the role of diet comes into the picture. Performing exercises regularly and following an appropriate diet help promote PCOD recovery effectively. Do include plenty of fresh fruits and vegetables in your regular diet. Do add fish and lean cuts of chicken in your diet. Do drink ample of water daily (two to three liters daily) to keep your body hydrated. Also, you can have healthy fluids, such as vegetable soups, freshly prepared buttermilk, and coconut water. Do include unsaturated fats in your diet. Do incorporate brown rice and antioxidant-rich red rice in your diet plan. Do use beneficial herbs and spices, such as flax seeds, cinnamon, fenugreek seeds, and coriander, in your daily cooking preparations. Do much on almonds and walnuts. Do include millets, such as oats, ragi, quinoa, and barley, in your diet plan as it helps cool your body. Do prepare various food preparations by using protein-rich whole pulses, such as chana dal, skinned green moong dal, and yellow moong dal. Do consume small meals after every three to four hours throughout the day. It helps you feel full and prevent you from binging on anything unhealthy. Do eat fresh and healthy salads. Do have a low salt diet, as it will help prevent water retention. Also Read :What is Pcod? Do not go for hydrogenated and saturated fats. Examine the label of any food product before you purchase it to check its fats’ content. Do not go for white rice. Do not go for cashews. Do not go for pickles and papads. Do not go for dairy products. Do not eat red meat. Do not go for sugary foods and unhealthy and aerated drinks. A diet religiously followed also helps you get rid of those ugly looking acne, control hair fall, and prevent unusual hair growth caused as a result of PCOD. There may be individual variations in diet as per the state of health. A diet well followed along with medications accelerates the course of recovery. A healthy lifestyle should be equally supplemented with diet, hence correct your lifestyle errors which may cause a hindrance to your recovery during the treatment. Exercise for about 30- 40 minutes every day. Go for a brisk walk daily. Practice meditation and perform yoga exercises. Avoid skipping your healthy breakfast. Make sure you do not eat junk food. Carry and eat homemade food whenever and wherever possible. Have a sound, continuous sleep. Avoid stress. Also, avoid taking unnecessary medications, opt for home remedies instead. Homeopathy has a definite role to play when it comes to PCOD. If you are suffering from PCOD, do let us know your feedback in the section below. We are here to help you if you have any queries related to PCOD and how to customize a diet to rid of PCOD. Feel free to get in touch with Dr Rajesh Shah’s associate doctors at Life Force Homeopathy. You may write in to us at info@lifeforce.in or give us a call at +91-22-66888888. Hi dr Kanchan. That was informative. I had a query. Can water stored in copper vessel help in regulating menses ?